Guwahati: Bhasker Pegu, age 23 years, is a research scholar at the IIT in Guwahati. He belongs to the Dhemaji district of Assam, located on the Assam-Arunachal border. 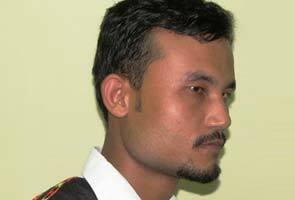 Mr Pegu has been living in Guwahati for the last six years. The spurt of killings which began in Bodoland autonomous region of Assam in North-East India and spread to many regions of the country, has been dubbed as India's biggest-ever internal displacement so far. This cycle of violence unleashed a collective insecurity as the fear of retaliation gripped the psyche of North-East people, especially people with Mongoloid features residing in South and West Indian cities. The outcome is the mass exodus to North-East India. While the Centre and Indian media squarely blames Pakistan and technology-driven rumours, propaganda and social media, we cannot deny the existence of conflicts due to the socio-cultural diversity of Indian society. Rather than blaming much on Pakistan and technology, we must also know the wound in ourselves for the recent exodus and violence. We must realise the fact that the current situation has much to do with the democratisation and consolidation of ethnic, religious and racial heterogeneity of Indian society. For close to two centuries, these people with Mongoloid features, lived in the wilderness with their tribal chieftains with sporadic wars within the region. In 1826, the Treaty of Yandaboo ended the first Anglo-Burmese War and brought about peace in the region. Today, they are suddenly caught between the hate and violence springing from religion and politics. A call from a friend of mine belonging to the Mising tribe, the second-largest tribe in Assam, got me thinking about the issue of the ethnic violence between the indigenous tribesmen Bodos and immigrant Muslims. He is a higher-secondary dropout from a government school located in rural Assam and he went to Bangalore six years ago to seek a secure livelihood as Bangalore is known as the I-T city offering much-heard-of employment opportunities. His panic-stricken voice over the phone on the eve of India's 66th Independence Day, was indicating the fear, insecurity and deep concern over the current situation of Assam. My response was that the situation has almost returned to normalcy in lower Assam in order to pacify his fears of a large-scale conflict. Many of us who reside in a culturally-diverse country fail to understand the unique identity of various ethnic groups. Many ethnic groups in North-East maintain their status quo, their exclusive identities. I was perplexed to hear from him that he and his North-Eastern friends lives are in 'danger' and they were looking for tickets to return. However, the efforts were in vain, so he sought our immediate assistance to arrange train tickets for a safe return before the "deadline August 20" approaches. I was extremely concerned about the safety of the innocent people who would bear the brunt of the conflict. So, I tried to clarify the details on the threats faced by the North-Eastern people in West and South India but the people were clueless about the origin of the threat calls. I also took the pro-active step of communicating with the public leaders of some organizations in Assam through mail. At 7:00 am on August 15, 2012, my friend apprised me of the confirmation of their return tickets. Around 8:00 pm, he reached the railway station and was shocked to see the masses of people planning their return to Assam by the two additional trains provided by Indian Railways to ease the rush of people. In the intervening night, I saw the news going viral on social media (Facebook and Twitter) and various news portals. I had commented on a news portal in the forenoon as a reaction to Prime Minister's speech on security and later during the night a follow-up brief blog on a community networking site. In the wake of debates on violence and mass exodus that sparked off from a small region of lower Assam to many parts of India, what is more crucial at this hour is mending our ways of perceptions and stereotypes that is entrenched in the Indian society. People from different parts of India settled elsewhere besides their homelands are more or less prone to social abuse in day to day life. This is evident from the 'chinki' tag accorded to Mongoloid-looking people in various cities of India. While acknowledging this, we must also know what is the enormity of stereotype within Assam or North-East India as well? How many of the legally settled immigrants of East-Pakistani origin are stereotyped as Bangladeshi nationals in social life, not just by people but in media too? The tensions between indigenous Bodos and immigrant Muslim settlers in lower Assam also extended beyond Assam to affect other North-Eastern states and those with Mongoloid features from Darjeeling. They too felt the pulse of insecurity and exodus. Many prominent political figures including the chief minister of Assam have conceded that porous borders are the root cause of recent violence and displacement. What is more questionable is -why not strengthen land laws in the state to leverage the safety and security of the indigenous peoples? It has been suggested by many intellectuals and scholars since many years that work permits should be alternative measures to discourage permanent settlement and land entitlements, when it is established that illegal influx is deeply rooted. While it must be accepted that unity and integrity of nation is at stake, as the Prime Minister himself had said in Parliament, the social understanding and tolerance among the people of India irrespective of race, ethnicity, region, culture or religion are only the way forward to instil an atmosphere of peace, security and stability to a nation celebrating the 66th year of Independence. The democratisation and consolidation within diverse sections of Indian society is the call of the hour, rather than putting the blame on Pakistan and social media. The roles of social organizations and political parties must go beyond their political imagination of electoral calculus as the integrated nation is much more significant. This can be achieved by keeping in mind the interest of unity and integrity at zenith. 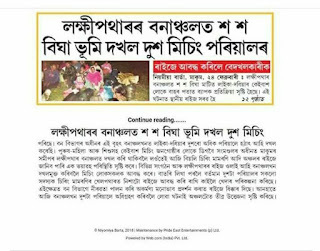 The sensible role of local media and leaders is equally called for in Assam. That will certainly pay dividends in bringing peace and stability in the communities. "What are you going to do back at home?" I raised the concern over the future scope of my friend in Assam who was one among the people returning from Bangalore. There was an eerie of silence from his end, "That is what I am thinking now, to engage in agriculture... the season of cultivation is also over". This is where the reality lies, the common people are sufferers of the day in the midst of information asymmetry and falsification of facts.